Many people struggle to find God's will for their lives. In fact, a large segment of the body of Christ believes that God sovereignly moves and makes everybody fulfill His will for them without their cooperation. In my opinion, that is one of the worst doctrines there ever was. If you think you're going to automatically fulfill God's will without seeking Him - without yielding or taking steps of faith and fighting against doubt and unbelief - you will be disappointed. Desiring to know God's will for my life was the thing that really got me seeking the Lord. The first eighteen years of my life were pretty much planned out, but during my senior year of high school, people started asking me what I was going to do for a career, about going to college, and about what my major would be. As I approached graduation, I knew I had to make some decisions. I went to my pastor and a number of Christian leaders to ask them how to find God's will for my life. And you know what? Nobody was able to give me an answer! I was just told to make a decision, and then God would bless it. Life is not a dress rehearsal. This is the real thing! And I realized that I was going to have to discover God's will for myself. Even though I didn't know exactly how to do that, I figured what I was looking for had to be in the Bible somewhere. So, I started actively studying the Word for five and six hours a day, looking for answers. I used to put a gooseneck lamp really close to my face. When I started to fall asleep, my forehead would touch the rim of the lamp, and the heat would wake me up. As a college student, I went with a church group to some cabins for devotions, and for the very first time, God supernaturally quickened a scripture passage to me - Romans 12:1-2. The revelation received that evening set me on the path I am still on to this day, and it started the process of how to find God's will. My How to Find, Follow, and Fulfill God's Will teaching came out of this, and it's a revelation I've referred to probably thousands of times since. It's not just up to you to pick and choose what you want to do. The principles from God's Word in this teaching will help you discover what that is, like it did for me. Wonderful things go along with finding God's will - a sense of satisfaction, peace, and joy that you cannot obtain any other way. If you don't feel the contentment that you long for, then maybe you aren't doing what God has called you to do. That deserves some serious thought, and this teaching series will equip you with the tools necessary to discover your purpose and prepare to live it. 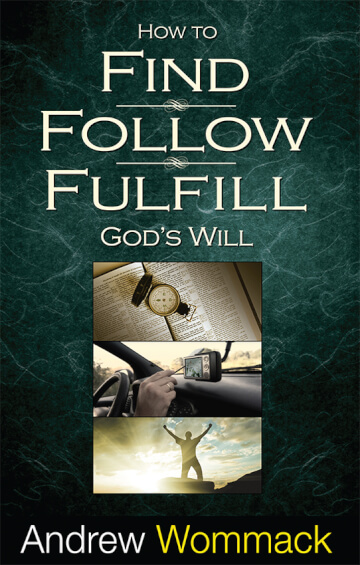 This month, we are offering the How to Find, Follow, and Fulfill God's Will package, which contains the book, three study guides, three CD or Live DVD albums, and a God's Will Testimonies flash drive - all for the price of $115. We are also offering the Living Commentary for a special half-off price of $60 when purchased with the package offer. These materials would really be a blessing to you. To order, go to http://awme.net/shop or call our Helpline on +44(0) 1922 473300?.